Rubber Products Distributors (RPD), located in Indianapolis, Indiana, is a distributor of rubber and plastic components. Founded in 1987, RPD is a just-in-time supplier with thousands of items in stock and available for immediate shipment. To be America’s silent supplier of industrial rubber and plastic products by providing unparalleled product selection, just-in-time delivery, competitive pricing, and excellent service with the human touch of a third-generation family-owned business. We shall foster our growth by keeping our approach customer-focused, forging new connections, and continuing to strengthen lasting partnerships. Rubber Product Distributors, Inc. received ISO 9001:2015 certification on August 20, 2018. The ISO 9001:2015 quality standard is recognized throughout the world as a significant achievement in assuring current and potential customers that the company receiving certification has a quality management system in place to provide a quality product. Rubber Products Distributors, Inc. and it’s employees are committed to the ISO 9001:2015 quality standard and takes pride in it’s achievement of meeting the requirements for certification. 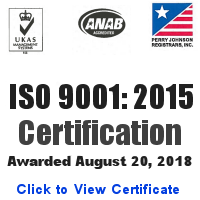 On August 20, 2018, Rubber Products Distributors became certified 9001:2018. View a copy of our ISO 9001:2015 certificate here. Rubber Products Distributors, Inc. is committed to meet or exceed customer expectations through our high standards of quality and delivery. We continually strive to be the best distributor of industrial rubber and plastic components, by fostering a quality culture based upon teamwork, responsibility, accountability, on-time deliveries, communications, integrity and trust. Rubber Products Distributors, Inc. is committed to continually review and find ways in which to improve its Quality Management System through the use of quality objectives. This shall be achieved through effective control of all functions that affect quality, and will be completed only when the product/service provided has met with total customer satisfaction.